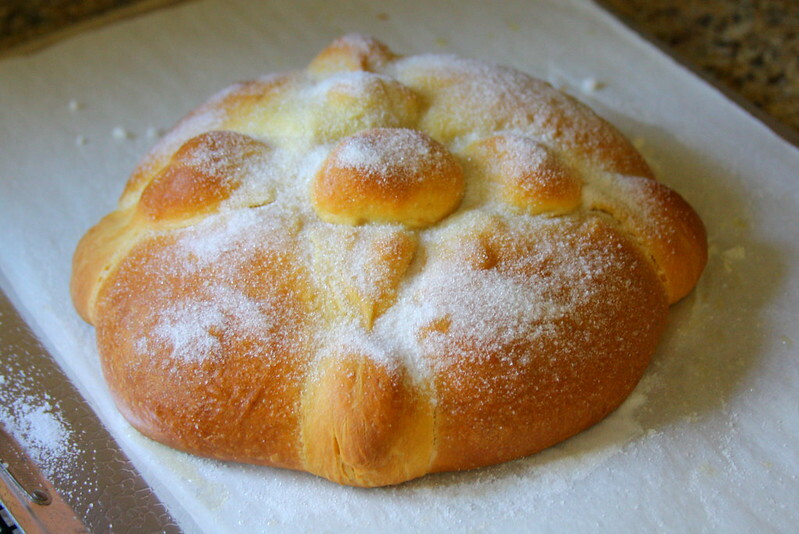 One of my favorite parts of celebrating Día de Muertos is making and eating the traditional pan de muerto or bread of the dead. 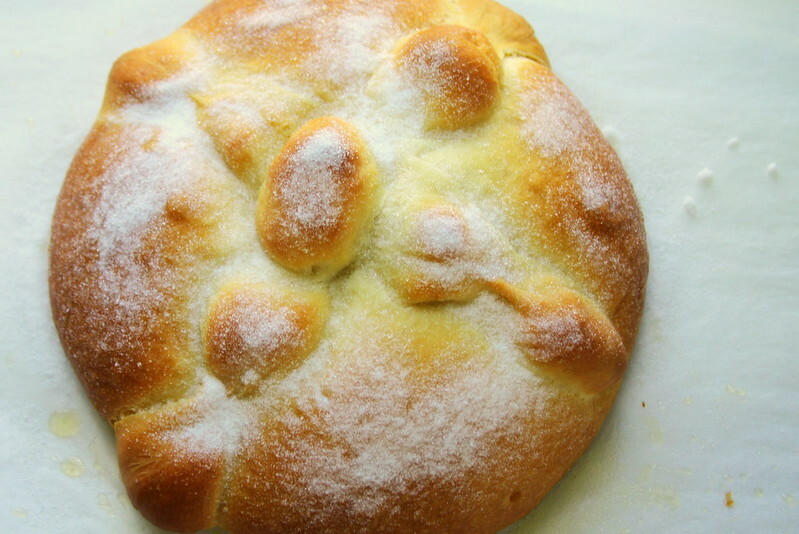 In the weeks leading up to the big celebration at the beginning of November, Mexican panaderías begin to fill their shelves with the sugar-coated loaves. The small, medium, and large rounds are topped with the classic crossbones design and seem to almost sparkle in the light from their generous dusting of sugar. 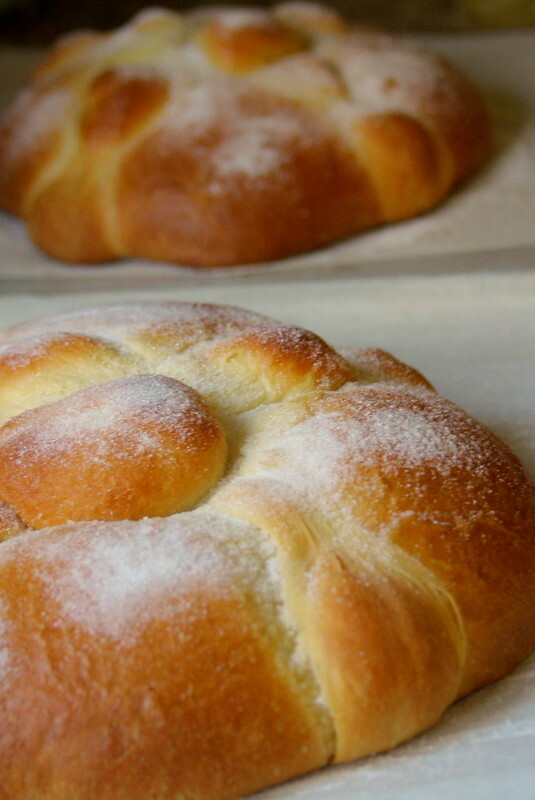 Pan de muerto is a sweet bread and tends to be rich and flavorful. Each panadería in Mexico has its own unique version of the bread. 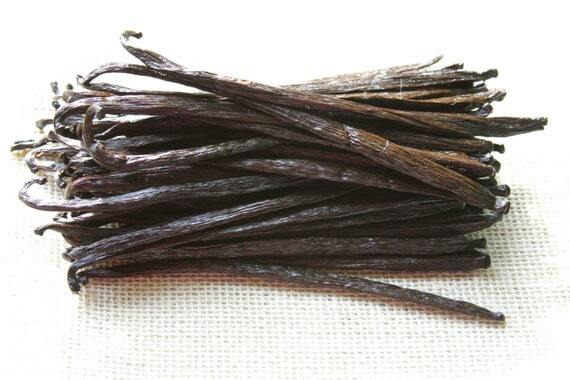 Some contain cinnamon while others are sprinkled with sesame seed. This particular bread is buttery and soft and has a slight hint of orange flavor from the added bits of orange zest. While the bread bakes up beautifully and is visually stunning, it is also quite delicious. It can be placed on any ofrenda or eaten as a snack any time of the day. While this recipe does require some time and dedication, the payback is definitely worthwhile. →Dissolve the yeast in lukewarm water. Add 1/3 cup of the milk and ½ cup of the flour. Mix well with a spoon or whisk (the dough should be sticky and smooth) and leave in a warm place (about 70°F) until it begins to bubble and puffs up slightly, 20-30 minutes. →Put the remaining 3 ½ cups flour in the bowl of a mixer with the hook attachment and mix in the sugar, salt, and orange zest for about 30 seconds. Add the eggs, the remaining 1/3 cup milk, and the yeast dough. Mix at low speed until the dough starts to come together. Add the butter gradually, in small pieces, while continuing to mix, and increase the speed to medium. The dough will look sticky, but resist the temptation to add more flour. Continue beating for 15 minutes, until the dough is soft and comes off the sides of the bowl. If the dough is still sticky after 15 minutes of beating, you may now add a little flour, if needed (no more than 1/3 cup). →Remove the dough from the refrigerator, uncover, and place a towel on top. Leave the dough to rise in a warm place (about 70°F) to come to room temperature, about 1 hour. →Cut off (don’t pull) a piece of dough about the size of a large lime and reserve to make the “bones.” **Divide the remaining dough in half and form two rounds, shaping them on a smooth surface and making sure the dough is compact. Place on 2 baking sheets lined with parchment paper. Lightly flatten the tops of the dough rounds with the palm of your hand. →Form some of the reserved dough into 2 gumball-size balls and leave on the baking sheet for later use. Divide the remaining dough into 4 pieces. Roll out with your hands from the center out, making strips that are about 1-inch longer than the width of the rounds. Spread your fingers and press lightly, making knobs that resemble bones. Place 2 strips on top of each bread round, crossing the strips over each other. Cover lightly with a cloth or plastic wrap. Let rise in a warm place (about 70°F) until doubled in size, about 1.5 hours. To tell whether the dough has doubled, press lightly with your finger. It should slowly spring all the way back. →Remove the cloth or plastic wrap. Place the small reserved balls in the center of the bread rounds, where the strips meet, using a little water to make them stick. →Preheat the oven to 350°F. Bake until the dough has an even, dark golden color, 20-30 minutes, then cover loosely with foil and bake until the internal temperature is 190°F or the bottom of the bread is browned, 10-15 minutes longer. Remove from the oven and allow to cool for a few minutes on a wire rack. →Melt the butter and brush on the breads, being sure to brush all around the knobs and over every inch. Using a spoon, sprinkle a generous amount of sugar over the top of each bread. If you use active dry yeast, make sure you mix it with lukewarm water to activate it. If you use instant dry yeast, just use cool water. The ID yeast does not need activated. If you live in a cold area, chances are your house is not exactly 70°F during this time of the year. I pre-warmed my oven for about 30 seconds-1 minute. Then, I waited another minute. Finally, I put my yeast starter or dough in the slightly warmed oven. The oven should NOT be hot. The reason I did this was because there is less air movement and the oven keeps a nice consistent temperature. **You could also make 4 small loaves. I made two batches of pan de muerto, and I actually liked the smaller loaves better. Cut off (don’t pull) a piece of dough about the size of a large lime and reserve to make the “bones.” Divide the remaining dough into FOUR pieces and form FOUR rounds. Make 4 gumball-sized balls and 8 bones. Bake the bread for 15-20 minutes, and then loosely cover with foil. Bake for an additional 10-15 minutes until bread is brown on the bottom.